Stethoscopes have evolved into cultural symbols for doctors and practitioners working in the field of medicine. All stethoscopes might look and sound the same, but to the trained eye and the specialized ear, no stethoscopes are created equal. The choice of what particular product to try, across a range of stethoscope varieties, is a question of one’s available time and patience spent into looking at what particular brand offers the best option. The diversity of fields in the medical sciences entails a diverse range of stethoscopes for any professional to choose from. For instance, among the important tasks of students in medical school is to buy themselves a stethoscope. Medical students use stethoscopes as an integral learning tool for elementary auscultation procedures. A durable and high-quality stethoscope would last until residency and well into a doctor’s career, and it is, therefore, crucial that medical students make the right decision as beginners into the field, whatever specialization they enter in the future. Stethoscopes used by medical students must cater to student-friendly budgets without compromising quality and performance necessary in learning the basics of auscultation and other related medical procedures. Emergency Medical Technicians or EMTs, meanwhile, are professionals that provide medical care during accidents, medical emergencies, and other emergency situations such as earthquakes and natural disasters. Among their many responsibilities, the patient assessment remains a top priority. Cardiac monitoring and performing advanced airway techniques are also some of the skills needed, and these activities require the use of stethoscopes. As these professionals are often called upon to respond to accidents that usually happen in less controlled environments such as in the outdoors or urban settings, they must be equipped with the proper tools necessary for effective emergency response. Stethoscopes used by EMTs must, therefore, be well-equipped to provide consistently high-quality sound performance in a wide variety of emergency settings and chaotic environments. On the other hand, respiratory therapists are trained professionals who specialize in cardiology and pulmonary medicine, catering to patients suffering from pulmonary disease. They can be found in many medical contexts, such as in administering anesthesia during surgery, managing life support for patients in intensive care, and as practitioners and healthcare providers in asthma and pulmonary rehabilitation clinics, pediatric clinics, and cardiology clinics. Specializing in this particular subfield of medicine would require outstanding expertise on performing examinations and assessments related to the cardiopulmonary system, a commitment that necessitates expert usage of stethoscopes and other related instruments. Stethoscopes used by respiratory therapists should, therefore, be of high transmission and amplification range for diagnosing rare abnormalities that are hard to spot. Given the vastly different but equally important responsibilities of medical students, EMTs, and respiratory therapists as well as other medically-related pursuits, it is integral that these professionals are equipped with the proper instrument so that they can perform their duties well. Choosing the right stethoscope mostly depends on the needs of its user, and any smart practitioner would evaluate the best stethoscope based not only on acoustic quality, but also on such factors as chest piece type and construction, tubing features, weight and durability of parts, and price. Here is a list of what we need to consider in looking for the right stethoscope. This is especially important for medical students and other practitioners who are looking for quality stethoscopes but would like to remain within a reasonable budget. Stethoscopes that go for low, entry-level prices from 15 to 40 dollars are inexpensive tools that can provide satisfactory performance for those still in training. Those in the 40 to 100 dollar range, meanwhile, are considered professional-grade stethoscopes that present a sufficient compromise between quality and affordability. Stethoscopes that are priced at higher ranges are those designed for specialist use regarding quality and performance, as well as durability and lasting use. 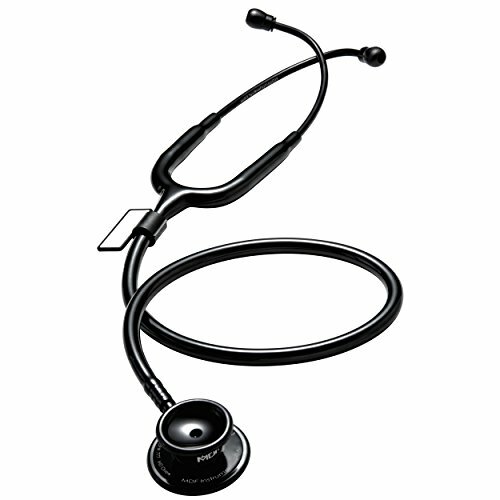 Stethoscopes vary in terms of how parts are designed and what materials are used in each instrument’s construction. These factors influence sound quality and comfort experienced in a stethoscope’s use. The chest piece is the major component of the stethoscope which picks up sound vibrations caused by the physiological functions of the patient such as breathing and heart sounds. Chest pieces can be single-head tunable diaphragms, dual-head tunable diaphragms, or the more traditional dual-head chest piece composed of bell and diaphragm components. The diaphragm is designed to pick up higher frequency sounds, while the open bell, which is the smaller circular side of the two, focuses on a narrower range of lower frequency sounds that are not easily detected by the diaphragm. Single-head tunable diaphragms are great for cardiologists and respiratory specialists as they offer improved clarity and amplification of high and low-frequency sounds by adjusting the pressure. Dual-head tunable diaphragms are more versatile tools that can be used for both adults and children. Meanwhile, the traditional dual-head chest piece is the most popular type of stethoscope as it can pick up a wide range of sound frequencies with both the diaphragm and the bell. Double-lumen tubing is an important feature in stethoscopes because it provides two sound paths inside one outer tube, eliminating rubbing noise between twin-tube stethoscopes. On stethoscopes with two-sided chest pieces, rotating the chest piece decides which side is accommodated by the single acoustic path. 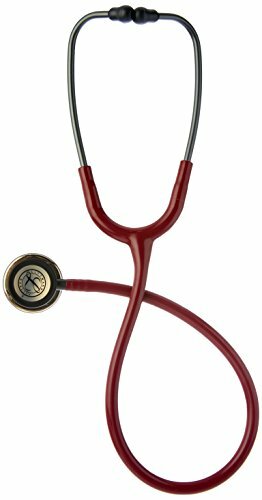 Selecting a heavy duty model stethoscope is important if one is expecting to use it frequently. Acoustics and durability, however, usually require quality materials that considerably add to the instrument’s weight, compromising comfort with a heavier stethoscope but of a higher quality overall. Length of tubing should also be considered, depending on the usual type of client or environment that the user shall respond to. The ear tubes and headset tension must also be designed and set at a proper angle for a comfortable fit for the user. The Omron Sprague Rappaport Stethoscope is highly recommended for medical students on a budget because it can deliver decent sound quality and comfort at the lowest price available in the market today. No doubt, this tool can address the needs of medical professionals-in-training as they learn the basics of auscultation and clinical assessment procedures. Offered at under 20 dollars, the Omron Sprague Rappaport Stethoscope is a commendable choice for medical professionals in training who are only beginning their careers and would need an inexpensive but reliable option. The Omron Sprague Rappaport Stethoscope is considered a 5-in-1 Quintscope as it comes with three sizes of open bells, two sizes of diaphragms, and two pairs of ear tips of different sizes. The diaphragms can be used to detect faint, high-pitched respiratory sounds and some components of cardiac sounds, and the two available sizes are fitted for children and adults. The infant-, child-, and adult-sized bells, meanwhile, are used to detect low-frequency cardiac sounds such as the first and second heart sounds. With the 5-in-1 Quintscope, the interchangeable chest pieces can be used both for adult and pediatric patients. One disadvantage of having a 5-in-1 Quintscope is the additional hassle one would experience in changing the chest pieces depending on each patient, instead of other stethoscope instruments which can adapt to the sound frequencies with only a rotation or a change in pressure. Moreover, the Omron Sprague Rappaport Stethoscope is double-tubed, a structural design that has a disadvantage of causing interfering rubbing noises. The additional ear tip sets serve to provide maximum comfort and proper fit to the individual user. The chest piece is chrome-plated, and the instrument comes with latex-free double tubing. Unlike other higher-priced stethoscope brands, the Omron Sprague Rappaport Stethoscope, unfortunately, does not include a non-chill ring for the patient’s comfort. The MDF Acoustica Deluxe is another excellent choice for medical students and EMTs on a budget because it can deliver quality sound performance as well as excellent comfort to both patient and user. 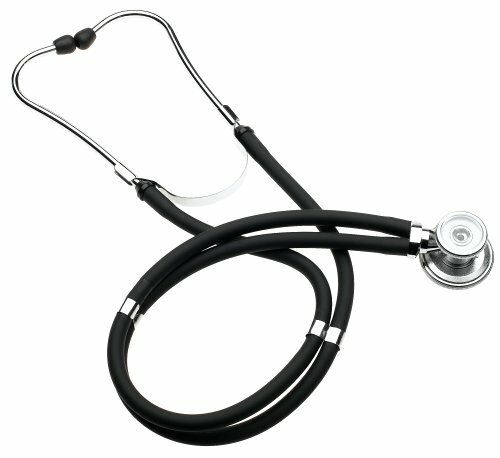 The MDF line of stethoscopes offers the Free-Parts-for-Life Program as well as a lifetime warranty, among other solid and reliable features. 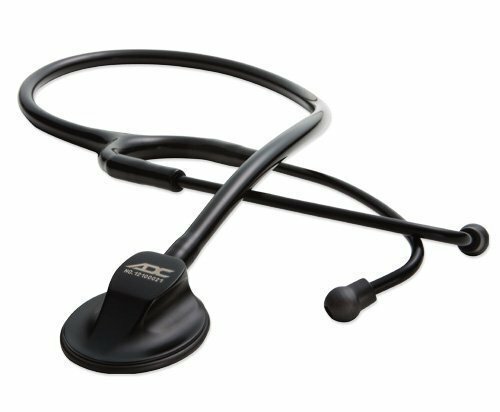 MDF Acoustica Deluxe Stethoscopes boast of delivering accurate auscultation of heart, lung, and Korotkoff or arterial sounds. The Acoustic Pyramid Chamber™ by MDF is an additional feature that is a patented internal metal-alloy chamber located in the middle of the stethoscope’s Y-shaped latex-free tubing. This structure is designed to ensure maximum sound transmission from the chest piece to the headset. The full-rotation chest piece is sealed with a non-chill retaining ring on both the bell and diaphragm side to secure acoustic transmission while ensuring the comfort of patients. The chrome-plated brass headset features an internal dual-leaf spring construction for durability and maintaining the shape’s integrity. However, some reviews report a weakly-constructed spring bar that easily bends out of shape. The MDF Acoustica Deluxe comes with clear and phthalate-free MDF® ComfortSeal™ ear-tips available in three sizes–small, medium, and large. The MDF Acoustica Deluxe also comes with an additional feature designed to prevent any risk for punctured eardrums with the patented SafetyLock Eartip Adaptors. With the versatility that this one-sided stethoscope brings, the American Diagnostic Adscope is a perfect choice for EMTs who are looking for an instrument that can keep up with the fast-paced and urgent nature of their work, without compromising the quality of sound delivered. 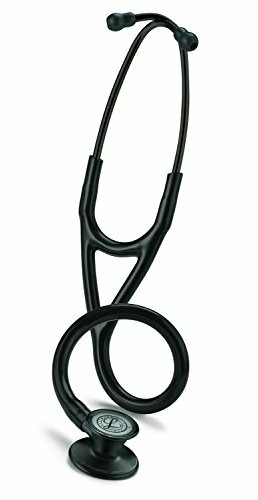 With the versatility, superb sound quality, user and patient comfort, and all-around excellence of the 3M Littmann Classic III Stethoscope, it is undoubtedly a highly-recommended product for any medical professional--medical students, EMTs, and respiratory specialists--who can afford to spend on a very high value-for-money instrument. Classic III, its versatility makes it a prime choice among medical students and professionals, and its superb acoustics make for its high standards amongst cardiology professionals as well. The 3M Littmann Cardiology III Stethoscope delivers all the features one would need in a stethoscope at such high quality and combined with excellent performance. The instrument ticks off on all important criteria while providing the best performance in terms of acoustic sensitivity, a necessity for clinical specialists who are looking not only for a tool to be used in general clinical assessment but also for highly specialized conditions and situations. It is the no. 1 recommendation for respiratory specialists who are looking for a high-performing instrument that can keep up with their complex clinical obligations.